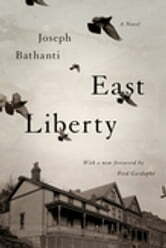 East Liberty is a poetic, passionate coming-of-age novel spanning 1955 to 1963, set in an Italian-American neighborhood in Pittsburgh. Roberto (Bobby) Renzo, the novel’s fatherless narrator and main character, lives with Francene Renzo, his beautiful, mysterious, and unconventional mother who gave birth to him out of wedlock. Together the two habitually watch vintage Hollywood movies on TV. Orbiting Bobby and Francene are the Catholic Church; Francene’s gothic, judgmental, Neapolitan parents; and the dramatically shifting culture at large hurtling toward them. While urged by the nuns at his school to pursue the priesthood — though his dream is to be a big-league baseball player — Bobby is drawn toward the temptations of the secular world, and finds himself involved in petty crimes and seduced by his awakening sexuality. As he emerges from his childhood cloud of innocence, his desire to know about his father becomes acute, and he is forced to confront the confusion and contradictions that rule his life. First published in hardcover in 2001, East Liberty won the Carolina Novel Award and was named a finalist for Foreword Magazine’s Book of the Year Award in Literary Fiction. This paperback edition features a new foreword by Fred Gardaphé, a distinguished professor of English and Italian American Studies at Queens College/CUNY and the John D. Calandra Italian American Institute.